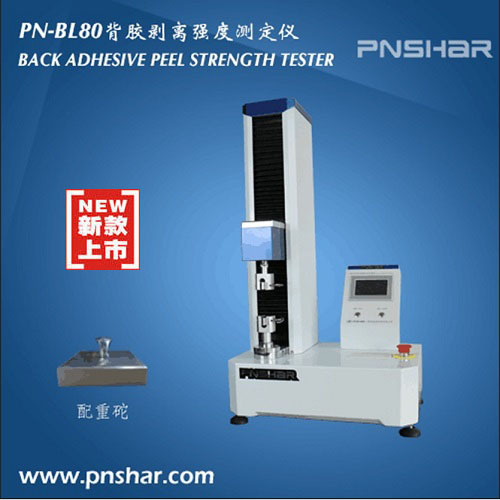 PN-BL80 back adhesive peel strength tester is a new tester developed by our company according to the specification of China National Standard. With mechanical and electrical integration configuration, the instrument is well-designed using modern mechanical design theory, human engineering design criteria and advanced high speed ARM processor. It is a new generation of tester with innovative design, convenient using, excellent performance and pleasing appearance. Vertical structure, within the working strok, the distance between two grips can be adjusted freely, big working stroke. It is professional for measuring the back adhesive strength of napkins (sanitary pads), can do the 180° peel, reliable and professional. With the functions of conversion, adjustment, display, memory and printing. With data-processing function to get the statistic data directly.